a Djinni may grant it. What an epic conclusion! Alwyn Hamilton is an incredible writer who weaves intense action with personal peril, overarching themes of what it is to be human – and not human, the lengths humans, Demdji, and Djinn will go for love and loyalty. Her prose varies from the intensely personal to a mythological storyteller looking back through the ages at the present day. In all that she engages us in the peril, the heartache, and the risk while she whips us about with dust and sand that rips our hearts apart. This is a truly satisfying conclusion, but be prepared with a box of Kleenex, true love does not end with a kiss, and while many died in book 2, there are those we care about in book 3 who will live on only in memory. Prisoners are freed, traitors redeemed, lives won and lost, and the kingdom trembles in the balance. What is the price of triumph? Myths are re-written, heroes resurrected, cities discovered and lost, Djinn released from the imprisonment of millennia. Move aside or join the cause; legends walk among us as new stories are indelibly etched on the collective memory of a nation. 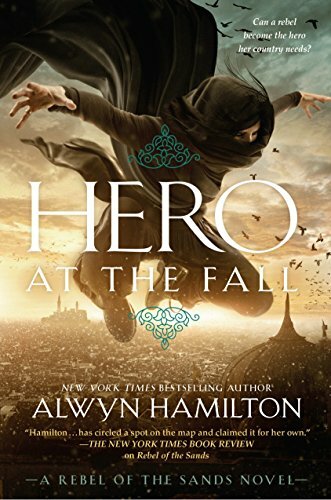 If you love Brandon Sanderson, Connie Willis, Louis McMaster Bujold or any of the other science fantasy greats, you will love Hero at the Fall. Highly recommended. If you haven’t read the other books in this series, this is not a standalone novel; start with Rebel of the Sands. You’ll be glad that you did!